Nico & Vinz are a Norwegian duo consisting of Kahouly Nicolay "Nico" Sereba from Holmlia, Oslo and Vincent "Vinz" Dery from Lambertseter, Oslo. 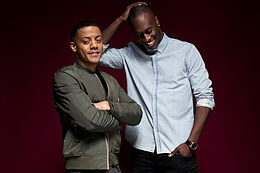 They formed in 2010 as Envy but changed their name to Nico & Vinz in January 2014 after the international success of "Am I Wrong". Nico Sereba of Norwegian-Ivorian origin and Vincent Dery of Ghanaian origin created their music as a fusion of genres as diverse as pop to reggae to soul, having been exposed by the various musical influences of their parents with whom they did recurring trips to the West Coast of Africa. The duo was launched as Envy with its main debut appearance at Emergenza Festival in 2011. They won first place at the Taubertal Open Air Festival World's "Emergenza Final" for new emerging artists. Following that success, the duo released the mixtape Dreamworks: Why Not Me under the name Envy. The materials were also made available online through WiMP. Sereba speaks English, Norwegian, and French. Dery speaks English, Norwegian, and Dagaare. In June 2011, the duo released their debut single "One Song" under the name Envy. The song peaked to number 19 on the Norwegian Singles Chart. Envy released their debut studio album The Magic Soup and the Bittersweet Faces on April 27, 2012, peaking to number 37 on the Norwegian Albums Chart. "One Song" was released as the lead single from the album peaking at number 19 on the Norwegian Singles Chart. It was followed by "Go Loud" released as a follow-up second and last single from the album. In April 2013, they released "Am I Wrong" under the name Envy. In January 2014, the duo changed their name from Envy to Nico & Vinz, in coordination with their signing to Warner Bros. Records in the United States to avoid being confused with other artists with a similar name. With international success of the single, the duo changed the credits of the single to the new adopted name. The song has peaked to number 2 on the Norwegian Singles Chart, the song has also peaked to number 2 on the Danish Singles Chart and number 2 on the Swedish Singles Chart. It also reached number one on the Mainstream Top 40 chart. It was followed up with another release "In Your Arms" which also charted in Norway, Denmark and Sweden. The music video for "Am I Wrong" was directed and edited by Kavar Singh. The video for "Am I Wrong" was filmed in Botswana and at the Victoria Falls between Zambia and Zimbabwe. It was put together in a deliberate effort to present a positive side of Africa when the image of the continent is too often mired in negative news stories. The music video was released via YouTube on June 20, 2013. In early 2014, Nico & Vinz received the European Border Breakers Award (EBBA) at Eurosonic Festival, performed at the Spellemann Awards, completed a Scandinavian tour, and launched "Am I Wrong" worldwide. When "Am I Wrong" made its American radio debut in April 2014, it was the number one most added record at the mainstream radio format and it peaked at number 4 on the Billboard Hot 100. They performed "Am I Wrong" at the iHeartRadio Music Festival in Las Vegas, as well as for the television show Dancing with the Stars in Los Angeles. Their album Black Star Elephant was released in September 2014, followed by the single "When the Day Comes" on October 2014. Nico & Vinz were featured on a track of David Guetta's 2014 album Listen, named "Lift Me Up" along with South African group Ladysmith Black Mambazo. Their song "Find a Way", featuring Emmanuel Jal, is featured in the film The Good Lie. "When the Day Comes" is featured the EA Sports game FIFA 15. In October 2015, the duo released the EP Cornerstone. "That's How You Know", featuring Bebe Rexha, was released as the first single from the EP and peaked at number 2 in both Norway and Australia. They also featured in Alesso's song "I Wanna Know". Nico & Vinz then released "Hold It Together" in January 2016, which is taken from their third studio album, due later in 2016. The second single from Cornerstone will be "Praying to a God". ^ a b Kellman, Andy. "Nico & Vinz | Biography & History". AllMusic. Retrieved 2016-12-01. ^ "Nico & Vinz Seek Their Next 'Am I Wrong'". Rolling Stone. Retrieved 2016-12-01. ^ Eurochannel. "Nico & Vinz - Norway - Eurochannel". Eurochannel: The European TV channel - European movies, TV series and music. Retrieved 2016-12-01. ^ ""We both speak english and norwegian. Vinz also speaks dagarra (a language from Ghana) and Nico also speaks french;)"". Twitter. December 22, 2014. ^ "Nico & Vinz". The Official Website for Nico & Vinz. Retrieved 2016-12-01. ^ Bill Lamb. "Nico & Vinz - "Am I Wrong" - Review". About. ^ "Nico & Vinz - Am I Wrong [Official Music Video]". YouTube. ^ "The winners - EBBA, European Border Breakers Awards, the awards for best European new music". www.europeanborderbreakersawards.eu. Retrieved 2016-12-01. ^ "Nico & Vinz - Chart history | Billboard". www.billboard.com. Retrieved 2016-12-01. ^ "Nico & Vinz headline iHeartRadio after party at HAZE Nightclub in Las Vegas". AXS. Retrieved 2016-12-01. ^ "Nico & Vinz Perform "Am I Wrong" On 'Dancing With The Stars': Watch | Idolator". Music News, Reviews, and Gossip on Idolator.com. 2014-09-24. Retrieved 2016-12-01. ^ Bianca Gracie (30 September 2014). "Nico & Vinz Release New Video For "When The Day Comes": Watch The Inspiring Clip". idolator.com. Retrieved 2 October 2014. ^ "Video: Nico & Vinz "Hold it Together"". www.auspop.com.au. 11 January 2016. Retrieved 15 January 2016. ^ "iTunes - Music - Black Star Elephant by Nico & Vinz". iTunes. ^ "Nico & Vinz Announce 'Cornerstone' EP". Boombox.